The BARC North Western Centre takes the keys of it's new Rescue Unit for it's first meeting in March 2018. After fourteen years of exemplary service the previous Rescue Unit has been retired. As well as running our race meetings at Oulton Park and Anglesey we will run the CNC Heads Championship for the 36th season. Our next event is the Race meeting on the 25th/26th May on Anglesey which will include, Legends, Endurance C1 race and CNC Heads. Andy Southcott took both races at Cadwell Park after two very exciting races. 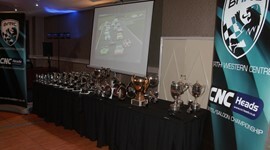 Dave Harvey, Paul Dobson and the Woolfitt's all challenged for top honours. Welcome to the North Western Centre site. The Centre promotes a very successful Sports/Saloon Championship and provides marshalling, officiating and Rescue Unit opportunities within the North West and further afield. Full details can be found within this site. If you are a budding racer eager to start competing or an experienced driver with a sports or saloon car of any type then our Sports/Saloon Championship currently sponsored by CNC Heads, now in its 35th season may be of interest.